Clearing a pattern removes all information held by a pattern: drumkit, name, beats and steps set. 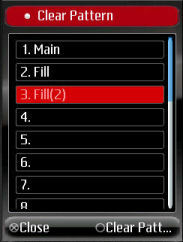 To clear a pattern, the Clear Pattern option is selected. A screen is displayed which shows all the patterns. 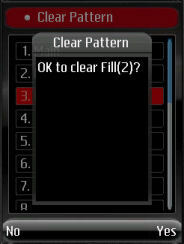 The pattern to clear is highlighted, and "Clear Pattern" is selected. The application asks for confirmation, selecting Yes clears the Pattern, No, leaves the pattern's contents unchaged.